480 Duke Street, Glasgow. G31 1QF.Tel: 01415545690. It the 1860s the Bluevale Seasonal School occupied this site. In 1871 a pub was built on this site for licensee Mrs John Murdock until around 1875. The address of the pub was then 478 Duke Street and she lived at number 480. By 1880 James Wood was landlord, serving the locals here until 1884. Mr Wood lived not far from here at 79 Roslea Drive. Robert Baird took over the licence in 1885, the name above the doorway was simply Robert Baird with wines & spirits at each side of his name. In 1899 the rent for this pub was a shocking £48.00 per annum, the pub stayed in the Baird family for many years. Robert died in 1911 leaving and massive amount of money in his estate valued at £8,713 7 shillings 5 old pence. In 1950 Agnes Baird was running this pub. 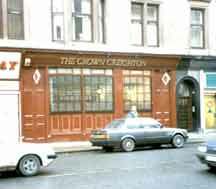 Another well known publican to hold the licence was Thomas Kieran who occupied the premises during the 1960s his wife Anne then took control of the business when he died in 1965, the licence was still in her name in 1973. 1950 Agnes Walker Bain Baird.